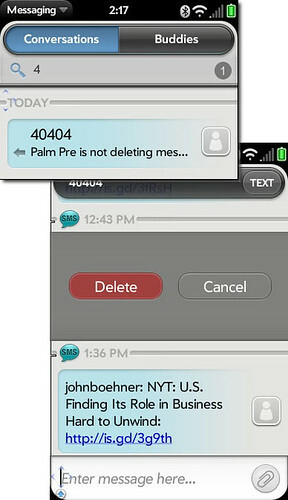 I have found that the Palm Pre works well for email and both MMS and SMS messaging on Sprint, but I’ve run into a glitch where my incoming messages will not show up in the messaging app unless I search for them, see screen capture (usually the conversations list unless I delete them). When I do locate the message conversation and swipe to right or left and tap Delete, the message conversation returns in its entire string the next time another message arrives — could it be a sync problem? The only way I have found around this (I think) is to open the entire message conversation and swipe/delete each individual message in the conversation until they are all gone. This is currently the way email works and a pain to clear email off the Pre — a delete all or checkmarking system would be appreciated. Let me know if you have this problem or have solved it.